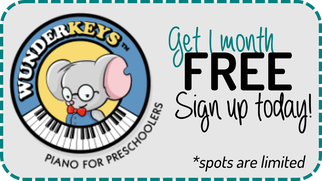 WunderKeys Piano For Preschoolers is a unique program for preschoolers ages 3 to 5. An encouraging first experience in music lessons is critical to your child’s enjoyment of their music instrument. The WunderKeys Program has been designed to be that and more! WunderKeys lessons are tailored to meet the needs of preschool-aged children and to ensure that their first music lesson experience is positive and enjoyable. Designed as an all-encompassing piano lesson, students participate in five different unique activities during their lesson time, ensuring they remain focused, engaged and happy. Throughout the 3 book series, your child will develop piano and music skills that will allow for a smooth transition into mainstream piano method books or a string instrument. Beginners in this program start with no prior piano or music experience and finish with solid keyboard awareness, an understanding of rhythmic notation, and the ability to play simple pieces with both hands. songs, patterning activities, finger poem exercises, book work, and music card games. We use songs, games, and fun manipulatives to keep your child engaged and begging for their next lesson! Mention this ad to get one FREE month of WunderKeys lessons! Offer available until February 1st and spots are limited. Sign up now to claim this amazing offer! After completing the Wunderkeys program your child will have the skills they need to continue on the piano or choose to take violin, viola, or cello lessons. We start preschool-aged children on pianos, because they are much easier to play when learning music and developing right and left hand independence. Our Wunderkeys graduates are able to pick up a string instrument much quicker than a child who did not begin on the piano first.